Four classic titles from Squaresoft (now Square Enix) have been rated by the ESRB for release on the PSP and PS3, indicating an imminent release to the North American PlayStation Store. Xenogears, plus Legend of Mana and Vagrant Story all have gotten Teen ratings, while Threads of Fate has been rated Everyone. Sony Computer Entertainment America is listed as the publisher, which almost certainly means these will be PSOne classics released over the PlayStation Store. 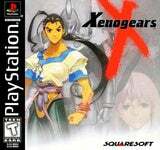 Xenogears was part of a PSOne classics release on the Japanese PlayStation Network back in 2008.